"The second-generation Apple tablet and the arrival of a CDMA version of iPhone 4 on the Verizon Wireless network together worked like magic to re-new interest in the iOS platform." 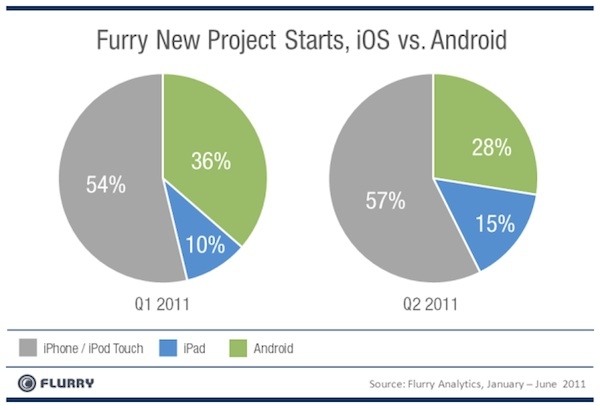 So even though there are reports of unhappy developers, iOS continues to be the platform that developers are using. Android lost about 8% in developer support from Q1 to Q2, dropping from 36% to 28% according to the survey. Interesting that we are seeing these developments after the Verizon iPhone arrival, so perhaps the huge numbers that Android was able to achieve prior were just because no one wanted to go to AT&T and would rather go Android. Now that they have a choice, they appear to be moving to iOS, at least the developers are seeming to move that way. What are your thoughts?